Rent our Euro Bungee and let your event be a succes, Your guests are fitted at the waist with bungee cords, which are used to suspend them from above, enabling them to flip, spin, and jump to amazing altitudes! Euro bungee it's transported with a truck, therefor the truck has to be able to enter where the Euro Bungee will be install. 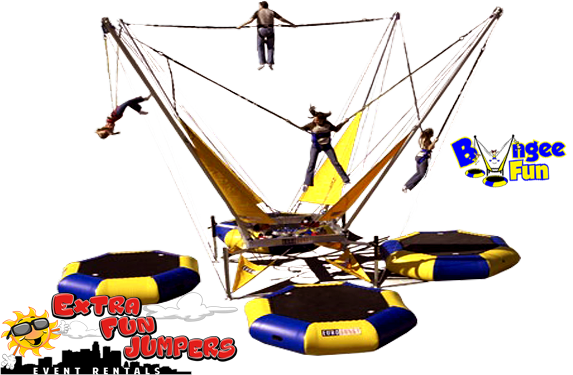 The Euro Bungee is great for kids ages 5 up to 21. 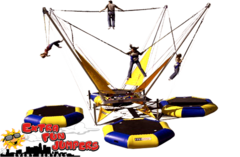 This ultimate bungee station handles four jumpers at one time. *Four people every three minutes. 40′ long x 40′ wide x 33′ high.